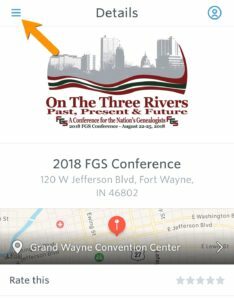 Keep the FGS 2018 program, speakers, and exhibitors right at your fingertips with the conference app. Download the Guidebook App on your iOS or Android mobile device or you can even access it on your desktop or laptop! Go to the App Store, Google Play, or Amazon App store and look for the Guidebook app. You can also go to https://guidebook.com/getit/ and have the download link sent right to your phone. 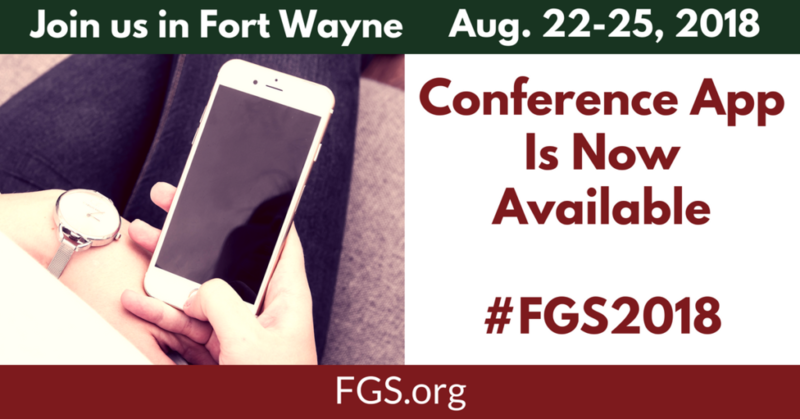 NOTE: If you’re using your computer or a device other than an iPhone, Android, or Blackberry 10+ device, go to https://guidebook.com/guide/133849/ to view the FGS 2018 conference app. Also, if you used the conference guide from the FGS 2017 conference in Pittsburgh, the Guidebook app might already be on your phone! We’re using the same platform this year. Tap “Find Guides” and enter FGS 2018. You’ll see the FGS 2018 Conference guide at the top of the list. Once you’ve downloaded the FGS 2018 Guide, tap to open it. When it’s open, tap the icon of 3 horizontal lines in the upper left-hand corner. Then you’ll see the menu with announcements, information, program, speakers, etc. Tap on any of those and explore! NOTE: When there is a number next to “Announcements from FGS,” that means that there is an announcement that you have not yet read.